Windshield repair is a great option that can save you time and money. If the damage on your windshield is less than the diameter of a loonie, it can likely be repaired - but don't delay because those small dings can become large cracks pretty quickly. More information on windshield repair can be found here. If your windshield is beyond repair - don't despair! replaced as painless as possible. More info here. 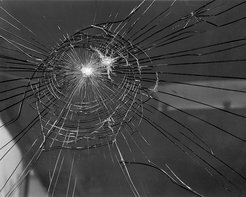 Whether you have a small stone chip that needs to be repaired quickly or a cracked windshield that needs to be replaced, we'll make sure it's done properly. Our trained and licensed technicians will ensure that your windshield will be the key safety component it was designed to be. All types of automotive glass, door windows, back windows, side mirrors. All glass for Heavy Equipment, trucks, transports, loaders, backhoes, mining equipment. We can custom cut and install safety glass in anything. Complete restoration of mining & heavy equipment cabs. What don't we do? We specialize in safety and tempered glass for the automotive, industrial and mining sector. We don't handle any type of plate or window glass for residential application. © Telstar Auto Glass Ltd.